Two football players barrel toward each other, shoulders wide, muscles taut and engaged. There’s an audible crash, and then both players crumple to the ground, still and silent. Luckily—in this case—the collision victims aren’t expected to move. They’re crash test dummies, reenacting football’s hardest hits for UAB engineers at the Barber Laboratory for Advanced Safety Education and Research (BLASER) at Birmingham’s Barber Motorsports Park. The BLASER dummies are among a growing repertoire of tools used by UAB researchers to study the problem of sports-related concussions. If the dummies were living athletes, they might have come out of the play noticing a headache and ringing in their ears, or feeling dizzy, light-headed, or confused—all tell-tale symptoms of a concussion. Across the country, athletes experience millions of concussions every year; on any given fall weekend, the injury sidelines players from NFL, college, and high-school teams. And it’s not just football—soccer, basketball, wrestling, ice skating, and bicycling (to name just a few) all have their share of concussions. Some athletes seem to recover quickly, feeling normal within hours or days, while others experience lingering head or vision problems. In either case, a growing body of evidence indicates that concussions—particularly repeated ones—can cause neurological problems years down the road. Scientists know the basics of what causes a concussion: When someone’s head is jolted quickly in one direction, the brain is shaken, slammed against the inside of the skull. This sudden turbulence can cause small tears in brain tissue, make a handful of cells die, or temporarily change the way the brain functions. But symptoms aren’t always indicative of internal damage, so questions abound on how to quickly detect concussions during a game, determine when players should be removed from the lineup, and prevent long-term effects. At the moment of collision, Dean Sicking, Ph.D., a professor in the UAB School of Engineering, and his colleagues are recording precise data on what happens to his crash-test dummies’ helmets—and their heads—when they smack together. Sicking spent most of the last three decades studying highway and road safety, designing better guardrails for Interstates and safer walls surrounding NASCAR racetracks. He was teaching an engineering class when football helmets first appeared on his radar. For an assignment, one of his students tested the impact absorbed by standard helmets. The result: almost none. “I thought his data couldn’t possibly be correct,” says Sicking. “So we got another set of helmets, and I repeated the tests with him.” They reached the same conclusion: Helmets were doing a poor job of protecting players’ heads. Now, Sicking and mechanical engineering research engineer Blake Feltman have launched an in-depth study to discover what it will take to make a better helmet. Along with the crash test measurements, they’re filming real-life football hits and—frame by frame—dissecting the angle, speed, and exact placement of each collision. This, they hope, will allow them to determine impact patterns as well as a threshold for severe impacts. With that information, they can better gauge the level of protection required for a helmet to curb concussion numbers. “Right now, there are no football helmet standards that specifically address concussions, and no pre-market testing related to concussions at all,” says Sicking. He wants to develop new standards that give manufacturers guidelines for testing helmet designs. And in the meantime, Sicking and Feltman are working on novel helmets too. Their blueprints are still tightly under wraps, but Sicking says he’s using the same basic principles of physics that inspired his designs for road barriers: If a barrier—or helmet—can slow down an impact and absorb as much energy of the impact as possible, then it exposes a person to less of the impact. Blake Feltman sets up dummies and sleds for the crash tests at the Barber Laboratory for Advanced Safety Education and Research. Even if engineers can design the ultimate protective helmet, it’s unlikely that concussions will fade into the past. That’s why clinicians and researchers in the Vestibular and Oculomotor Research Laboratory (VORLab), in the UAB School of Optometry, are studying the aftermath of concussions in order to measure recovery and help protect patients from long-term effects. “Eighty percent of kids recover from a concussion on their own,” says UAB optometrist and associate professor Katherine Weise, O.D., M.B.A. “But that other 20 percent might get hit during a Friday night game, and then they end up in the concussion clinic the next week still feeling weird.” Right now, there’s no way to predict which group someone will be in, and no way to effectively test therapies to see if they change this course of recovery. The new lab—one of only a few of its kind in the country—focuses on the fact that concussion often disturbs a person’s vision and sense of balance. By integrating information from the inner ear and the eyes, the body’s vestibular-oculomotor and visual-oculomotor systems allow you to maintain a stable image of the world as your head moves, track a moving object, and avoid double vision, among other tasks. But the part of the brain responsible for coordinating these systems is particularly prone to being disrupted by a concussion, even if athletes don’t immediately notice a sense of imbalance or visual alteration. The VORLab’s goal is to detect any slight alterations in the systems that could signify brain damage. Weise and her collaborators—the lab’s co-directors, vision science researcher Claudio Busettini, Ph.D., and physical therapist Jennifer Christy, Ph.D., P.T. ; along with neuro-rehabilitation psychologist Laura Dreer, Ph.D.; optometrist Mark Swanson, O.D., M.S.P.H. ; and Johnston—have installed a new chair in the VORLab that’s letting them perform in-depth studies on athletes’ vestibular- and visual-oculomotor systems. The chair isn’t a typical eye exam chair; it’s finely tuned to rotate at various speeds while areas around it light up like a planetarium or remain dark. By measuring how a person’s eyes move in coordination with the lights, a target, or the chair, the researchers can precisely evaluate the function of both systems. The School of Optometry's high-tech VORLab sheds light on the lingering effects of concussion. For now, their tests compare athletes who have recovered quickly from concussions to those who have had lingering effects. “We’re hoping we can take that 25-minute exam and figure out the one or two nuggets of information that really help us identify concussions, rather than a constellation of 20 tests,” says Weise. Then, they’ll launch other studies using the chair, to track how the oculomotor systems change over time as someone recovers from a concussion, whether the systems can be used to gauge the effectiveness of therapies, and how they are altered after many small hits to the head. It’s not practical to perform a full vestibular system exam on every athlete every time he or she gets hit. So researchers hope the lessons they learn can be adapted to sidelines, schools, and outpatient exam rooms. One challenge is identifying “return-to-think”—the amount of cognitive rest needed to maximize academic performance and recovery following a concussion—in addition to “return-to-play.” “Currently, there are no evidence-based protocols to guide school professionals, parents and pediatricians,” says Dreer. Outside the VORLab, she and a team of researchers from the UAB Department of Ophthalmology and community partners are studying health promotion and rehabilitation approaches to help fill the gaps. With this in mind, the VORLab researchers also are testing the utility of pupillometers—handheld devices that image the eye’s pupil—to diagnose concussions. They’ll distribute pupillometers, as well as memory cards to store each player’s data, to community football programs around Alabama. “Everybody watching a sports event can tell when someone has gotten a huge hit,” says Swanson. “But we’re less sure how many little hits someone can take.” With the pupillometers, researchers can see how an athlete’s eyes change over the course of a season, after repeated hits. This, ideally, will reveal signs of brain injury that can let players know it’s time to take a break. But the ultimate utility of all these tests comes down to how coaches, players, and parents use them, the researchers say. So in collaboration with former UAB football player Kevin Drake’s Wise Up! initiative and UAB undergraduate students, the UAB Sports Medicine Concussion Clinic at Children’s of Alabama is launching community partnerships to promote concussion awareness and education. Dreer and her colleagues also are measuring the effectiveness of similar efforts—a project that could shape health policies, school protocols, and clinical care. In the end, addressing concussion will require a team approach, from designing better helmets and novel screening methods to developing new regulations, revising gameplay rules, and improving knowledge on the sidelines. 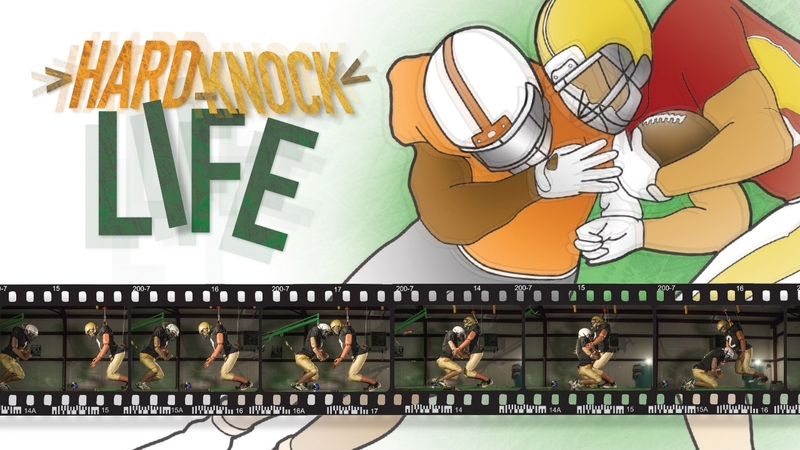 All of these efforts to protect the brains of our young athletes, say UAB researchers, can help protect their futures. Feltman (right) and a School of Engineering graduate student prepare a dummy for another test, which could point the way to new helmet standards targeting concussion. • Learn more about Sicking's concussion research in the School of Engineering. • Learn more about concussion research and treatment in the School of Optometry. • Get help for concussion from UAB Sports Medicine at Children's of Alabama. • Give something and change everything for concussion research and care by supporting UAB's efforts in engineering, optometry, and medicine.